Do you remember when you were a kid and your mom or dad would make you sit still and cut your nails? It was never a positive experience. You wanted to squirm and play, but you had to remain motionless and bored for however long it took. Dogs and cats feel the exact same way. Claw clipping doesn’t come naturally to animals. They’d much rather have sharp talons with which to grip and tear. That’s why getting them comfortable with handling their paws isn’t always the easiest of endeavors. Dogs and cats alike don’t really care for the procedure, and for humans it can be a complex situation. So in the spirit of simplification, Petbucket will be publishing a series of blog posts to help educate you on the basics of claw clipping. Today’s subject is how to cut dog’s nails. Dogs are naturally averse to having their paws touched. So it’s important to internalize this behavior early on. You should begin handling your puppy’s paws as soon as you bring them home, that way they won’t be so mortified at the idea of nail clipping later on. You won’t get much done unless you have the right equipment. 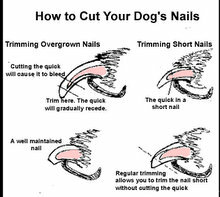 There are several options for cutting dog’s nails. You have guillotine, scissors, pliers, and grinders. The most popular among professionals are the pliers style. These are spring loaded and adept at clipping claws, even thick ones, with minimal effort. Scissors and guillotine nail clippers work exactly like they sound. Either with a close handed grip or with the flick of a switch, off goes the top of the nail. Alternatively, grinder style clippers work like Drimmels. They slowly sand down the nail with rotary action rather than a clean cut. This process is much easier when your dog has lightly colored nails. This is because the pink quick will be fairly visible underneath the translucent white casing. On dark colored nails however, you must be much more careful. It’s probably best to make several shallow cuts to ensure you won’t get overzealous on your first try. It will take longer, but your dog will appreciate your patience. When you feel comfortable enough to give it a try, it’s time to find a comfortable spot for trimming dog claws. It has to be a spot where both you and your dog can feel relaxed. Some people like to sit on the floor, while others prefer a bed or couch. There’s no wrong way to handle it, just make sure you have control over the dog’s position and you both feel comfortable sitting there. That’s all for today’s lesson. Check back tomorrow for more nail cutting clues!